TreeViewSpreadExport utilizes our RadSpreadProcessing libraries to export the contents of RadTreeView to xlsx, csv, pdf or txt formats. This article will explain in detail the SpreadExport capabilities and will demonstrate how you can use it. Here is how the following RadTreeView, looks when it is exported. To use the spread export functionality, an instance of the TreeViewSpreadExport object should be created, passing as parameter the RadtreeView instance to export. Afterwards, the RunExport method will trigger the export process. The latter method accepts as parameter a filename of the file to be exported. You should pass an instance of a SpreadExportRenderer to the export method as well. The RunExport method has several overloads allowing the user to export using a stream as well. Dim exportFile As String = "..\..\exportedData.xlsx"
ExportFormat: Defines the format the TreeView will be exported to. The available values are Xslx, Pdf, Csv, Txt. The default value of the property is Xslx, hence if not other specified, the exporter will export to Xslx. ExportVisualSettings: Allows you to export the visual settings (themes) to the exported file. 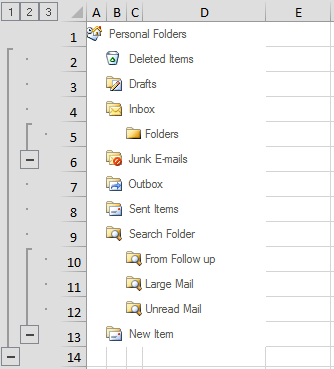 RadTreeView will also export all formatting to the Excel file. 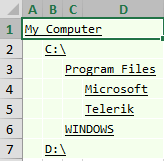 65536 (default): Max rows for previous versions of Excel. This is the default setting. SheetName: Defines the sheet name of the sheet to export to. If your data is large enough to be split on more than one sheets, then the export method adds index to the names of the next sheets. 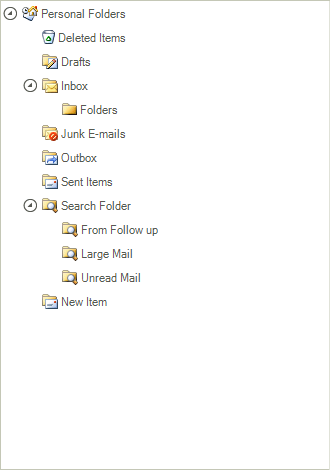 NewSheetInExistingFile: This option will create a new sheet in an already existing file. CreateOrOverrideFile: Creates new or overrides an existing file. ExportImages: Gets or sets a value indicating whether to export images. ExportChildNodesGrouped: Gets or sets a value indicating whether to export child nodes grouped. NodeIndent: Gets or sets the indent of child nodes. CollapsedNodeOption: Gets or sets a value indicating how children of collapsed nodes are exported. TreeNode: Gives you access to the currently exported node. ExportCell: Allows you to set the styles of the exported cell. ExportCompleted: This event is triggered when the export operation completes. 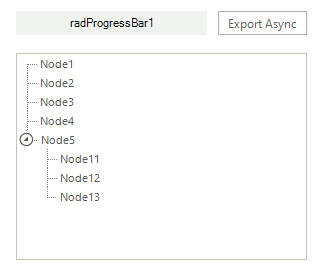 RadTreeView provides functionality for asynchronous spread export. This feature can be utilized by calling the RunExportAsync method on the TreeViewSpreadExport object. If the ExportVisualSettings property is set to true the UI can be freezed at some point. This is expected since exporting the visual settings requires creating visual elements for all nodes and updating the exported control UI. The following example will demonstrate how the async spread export feature can be combined with a RadProgressBar control to deliver better user experience. The following code shows how you can subscribe to the notification events and start the async export operation. 2. Handle the notification events and report progress. Dim exportFile As String = "..\..\exportedAsyncData.xlsx"
The following methods of the TreeViewSpreadExport class are responsible for exporting the data. RunExportAsync: Starts an export operation which runs in a background thread. CancelExportAsync: Cancels an export operation. The following events provide information about the state of the export operation. AsyncExportCompleted: Occurs when an async export operation is completed.